Bauer became an adult yesterday. His birth certificate from the Humane Society said he was born on May 21, 2008 but that is not why he left his kitten ways behind. Yesterday Bauer was able to use his feline mind trick powers to coax a bird into our laundry vent. He did not realize he was successful in his mission until Jenna turned the drier on to clean some clothes and heard some rustling and a faint chirp. For the next few hours Bauer awaited his prey by the drier, staring at the metallic tubing for hours, waiting for his chance to attack. 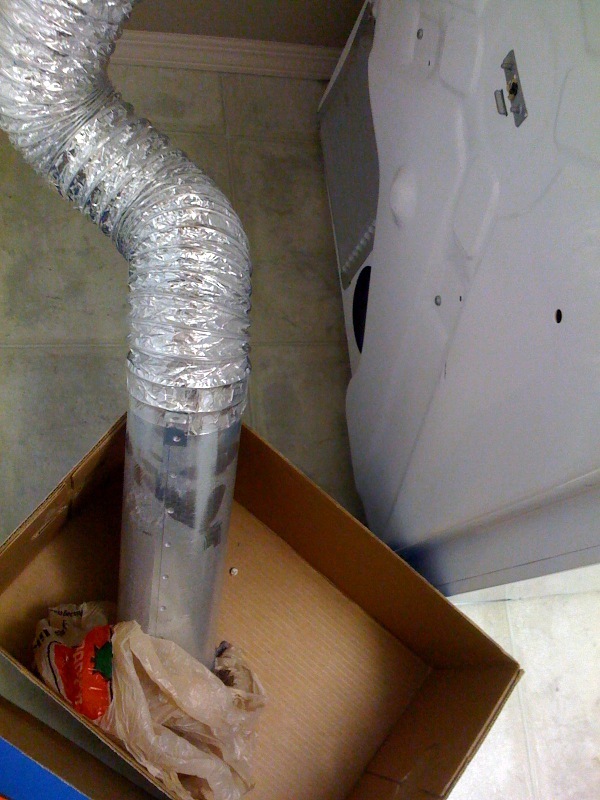 When I returned from work I cleared out the laundry room to make room to move the drier and began my extraction of whatever was in the tubing. I had no idea how big, or how small, the bird was in the tubing when I was shaking it out so I expected the worst. 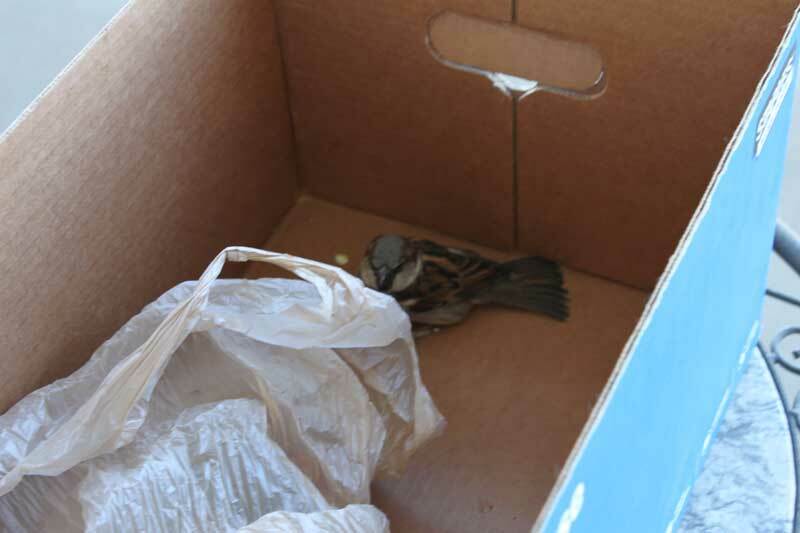 Even though I knew a bird was in the tubing I was still surprised to see a dust covered bird plop into the box. 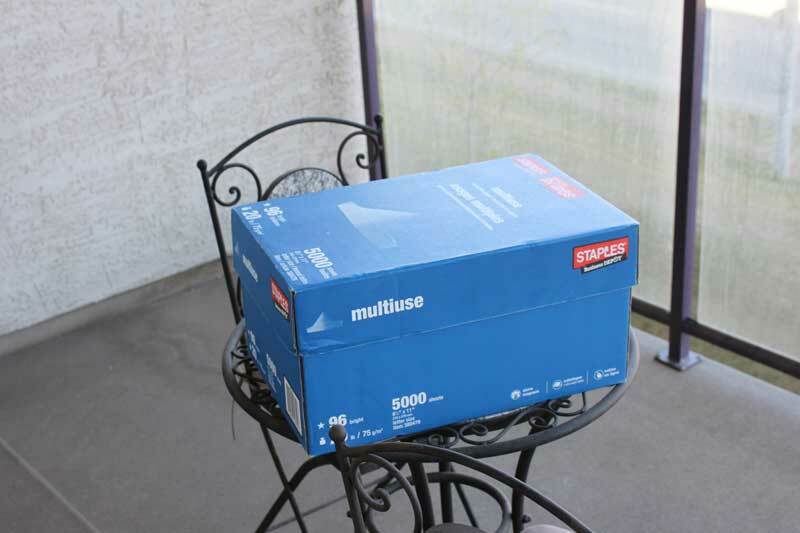 I carried the box to the balcony and took the cover off expecting the bird to immediately fly away. 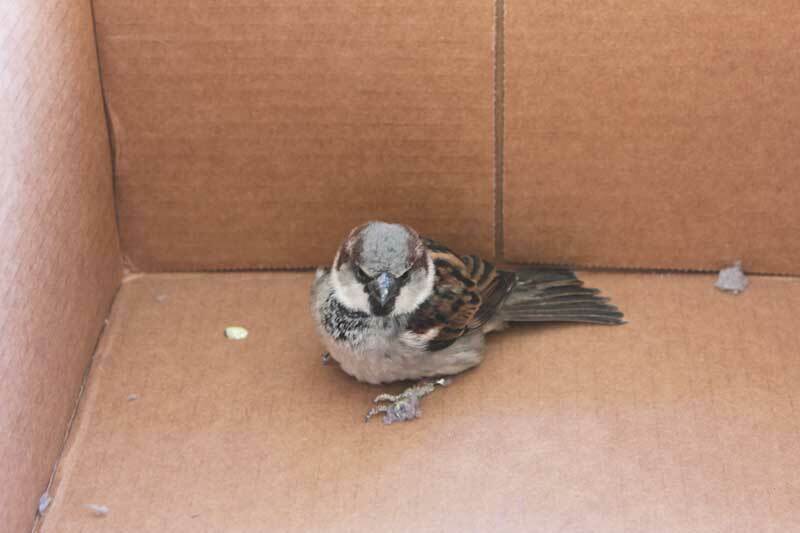 It stayed in the box for a minute or so, examining its surroundings and then flew away seeking salvation in a nearby tree. How the bird got into the drier’s exhaust is a mystery, but I am sure Bauer is already planning his next mind trick on a much larger target for his second birthday. Michael Emerson, who plays Ben Linus on ABC’s LOST, says that the season finale for Season Five will make you want to eat your soul. I went into the season five finale of Lost cold. All I saw was a cut off preview after the end of Follow The Leader, but surely not enough to have predicted what would happen last night. Right from the opening you knew this episode was going to be different, and having what Michael Emerson said in the back of my head I was prepared for anything…how naive I was. It feels like the fifth season just started and now I begin the last eight to nine month wait for the final season to return. Last nights episode was everything I could have hoped for and then some. If you had not seen the finale then turn back now because I will be talking about episode specific things. The beginning sequence set the tone for the episode with the introduction of the infamous Jacob, and perhaps the Black Rock approaching in the distance. 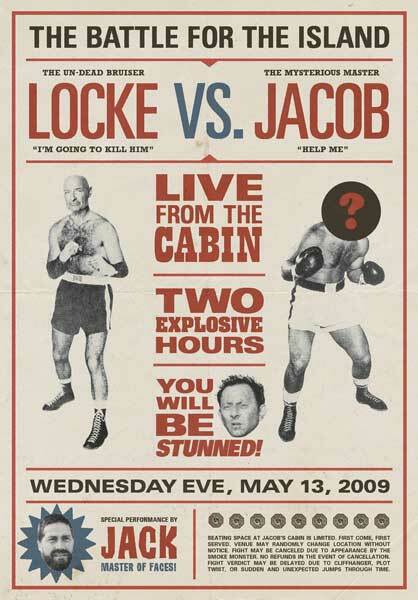 Jacob appearing as a background character in the lives of Oceanic 815, at critical times in their lives was a huge thrill. It almost became a game of ‘guess who the character is’ when you went through a flashback. Jin and Sun’s wedding vows, the “count to five” surgery Jack had always talked about, Kate and Tom getting their memory lunch box, Sawyer’s letter, Nadia’s death; little pieces of history coming together. Everything about this show is now uncertain. Whatever I had figured out is now rewritten. What is going to happen next? Better yet, what can happen next? Even though 30 years separate the events will the death of Jacob be affected by Juliet setting off the bomb? Or was Miles right and the Incident Jack was trying to prevent was actually him that caused it and nothing will change? Will next season start with them landing at LAX successfully or has all of this happened before and will continue to happen? A dream that would have taken the Canucks all the way to the Stanley Cup finals. This year felt different, it felt like we had a chance. We came off an amazing second half and went into the first round of the playoffs with a full roster. To celebrate the occasion I decided to grow a playoff beard. No razor would touch my face as long as the Canucks were still in the post season. I have neglected to shave before, usually over a weekend, but the only area that would see growth was a perfectly formed goatee. I felt that this challenge would be a good way to find out what can grow where, and how much. I was one day shy of going four full weeks without shaving, almost went the duration of Survivor, and then the Chicago Blackhawks came along and outgunned my team in a thrilling sixth, and deciding, game. I held a moment of silence for my team and my recently crushed hopes and shaved off the beard. The aftermath wasn’t pretty but the end result was a smooth face I had not felt in a long time. When I was all done I realized how much I licked my upper lip because I never quite got used to the feeling of the bristly mustache. Most people said I looked very French, not sure if that was a compliment or an insult. Either way, it was a sight to behold as it grew in a very sleazy way. 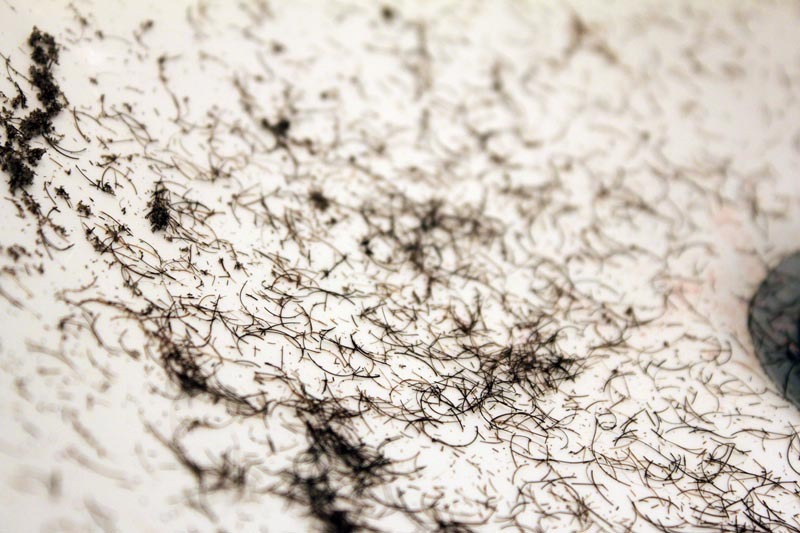 Forty-nine photos were used in the animated image of the playoff beard, but if you want to see it a little better you can see it in 334×338 (2.8MB) or the larger version of 556×553 (7.2MB). Thanks for the season Canucks, one day we will reach our dream together. The third, and hopefully, final show that I watch aired its final episode this week. The doctors and nurses of Sacred Heart aired what could have been the series finale for Scrubs on Wednesday. I have been a fan of Scrubs for many seasons. Like most shows I watch over multiple years I was able to see the show start out young, and fresh, and then slowly evolve over time. Whatever road it went down Scrubs still remained one of my favorite shows to watch. The comical timings were excellent, the dream sequences were outrageous (Turk and JD walking into Sacred Heart as pimps, Luftballons) and had some remarkable jokes (Pancake Drawer, Warrior, Safety Dance, Toto, Moment Killer). I think I reference Scrubs in my day to day conversations more than I realize. Scrubs also had a direct impact on “Pioneer on the Internet” as I adopted the “My” naming convention for posts back in November 2005. Scrubs is one of the only shows where I have spent hours going through uploaded clips and remembering the good times. Even while finding clips for this post I spent another hour going from one to another, trying to find specific moments or just see what people had thought was worthy of uploading. Still, for all of the good times there were some low points with the Scrubs franchise. Most fans of the show will agree that the first few seasons were amazing and the quality started to go down around the later seasons. To add insult to injury the show suffered neglect by NBC and was not given proper treatment in its seventh season. The future of Scrubs was in jeopardy and Bill Lawrence (creator) was able to negotiate a move for the show over to ABC and give it the proper ending he felt it deserved. The season on ABC had a definite change in production, writing and feel. The show returned to a darker lighting, with less focus on trying to outdo past stunt and more on the people and relationships. It was a season that fans could be proud of and remember Scrubs the way it used to be. Now, the future of an ninth season is to be determined but Zach Braff has decided to leave the show and Bill Lawrence is unsure of his involvement for another season. I have read discussions that the show would continue and focus on the new interns, with some remaining cast to help out. I can see it working, but for me, at least emotionally, Scrubs ended on Wednesday night. The final episode, appropriately titled “My Finale”, was an emotional and fitting end for the show. Many things were not addressed but it was great closure on several items. The fifty plus guest appearances was a fantastic touch at the end, especially Mrs. Tanner from the epic season one episode My Old Lady. This series had a healthy mix of relationships, medical drama and comedy. Occasionally the balance would shift but at the core of it all was a fantastic show that is worthy of multiple re-watches or watching for the first time.